David Cadogan is an English artist who has made his name as one of the Caribbbean's leading watercolour painters. He has worked as a professional artist for more than twenty years, and for much of that time has combined his artistic talents with those of a successful yacht captain. He has skippered large sailing yachts in the Caribbean, US and Mediterranean , and his log of over 100,000 sea miles includes a three year round the world voyage. 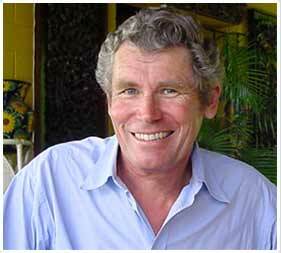 He first sailed himself out to the West Indies in 1980 after an earlier marketing and advertising career in the UK . The people and places of the Windward and Leeward islands provided wonderful material for his fresh, lively paintings and the charter skippers work soon started appearing in private collections around the world as well as galleries and exhibitions in the islands themselves. David has now given up full time sailing in order to concentrate on his painting and it is not surprising that much of his work is to do with the sea and the beauty of sail. His studio is in English Harbour , Antigua and he exhibits there and in several galleries both on the island and in England . David is delighted to undertake private commissions, working from photographs or brochures if necessary. If you would like to discuss a project, do please get in direct contact with David by telephone or through the enquiry form on this website.